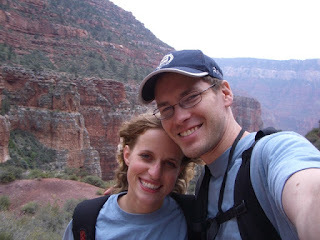 Tim and Rebecca: The Grand Canyon: We made it. Wow! The Grand Canyon: We made it. Wow! 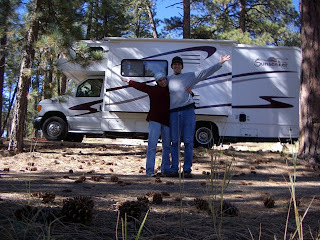 For our honeymoon, we drove to the Grand Canyon in an RV. We recommend it to anyone! 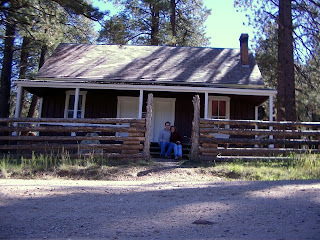 On our way, we stopped at the historic Jacob Lake ranger station, where Rebecca's grandfather used to work. The drive to the Canyon was gorgeous. 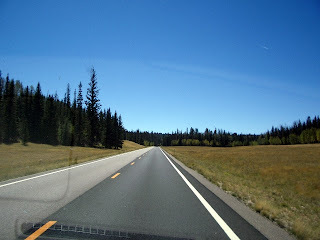 The road was lined with deep green pine trees and autumn-yellow aspens. It reminded me a lot of the Montana scenery I grew up in. 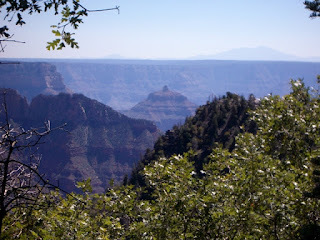 Here's a shot out of the RV windshield of the entrance to the North Rim of the Grand Canyon State Park. The Canyon itself was still a few miles away, but this was sure pretty anyway. And here's our first shot of the canyon itself. Amazing. It just struck us speechless. 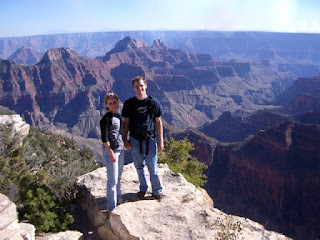 We learned later in the lodge that when most people get their first glimpses of the Grand Canyon, they won't talk above a whisper. Why? Don't know. Perhaps it's just so awesome that it makes us feel like we need to be reverent. 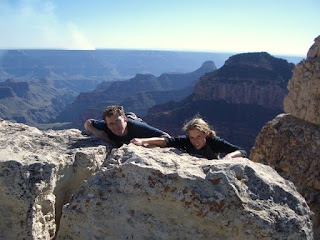 Getting close to the edge of the rim took a bit of courage! When we looked down towards the bottom and we saw huge trees and enormous boulders looking like specks, it made me realize how far down that was, and how incredibly tiny I am! And if that weren't enough to remind us just how deep it was, there was a cold and surprisingly strong wind that blew up from the canyon. It felt like we were looking over the brink into a completely different world. What a cool place to spend one of our first days as a married couple! We decided to take the shortest way to the bottom--straight down, and then straight back up. Here we are reaching the top again. We hiked all the way down to the bridge at the bottom of this ravine, and that wasn't even close to the Colorado River. 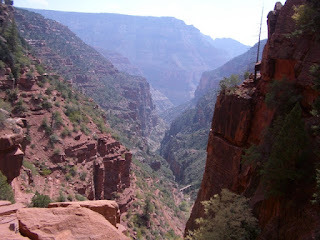 This side canyon feeds into another side canyon which feeds into the main canyon. We're going to come back and do it all again someday!